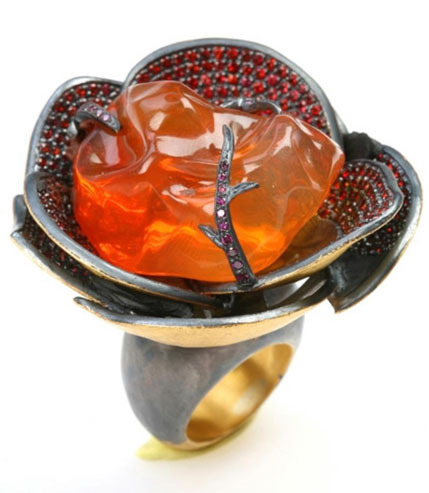 Sevan Biçakçi is a jeweler out of istanbul who creates pieces, primarily rings, with a distinctive Turkish flair. 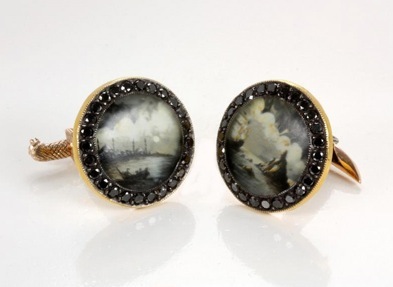 He won a 2009 Couture Design Award for his cufflinks in gold and silver with miniature paintings showing two views of Istanbul. He was profiled in Fashion Trend Setter in 2007 after he won a few awards. 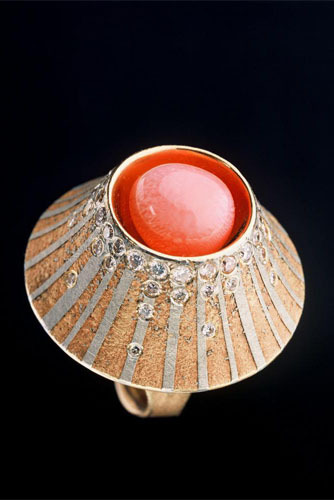 In the current collection are various rings utilizing gems with faceted outsides and a small form, perhaps a building cut internally. 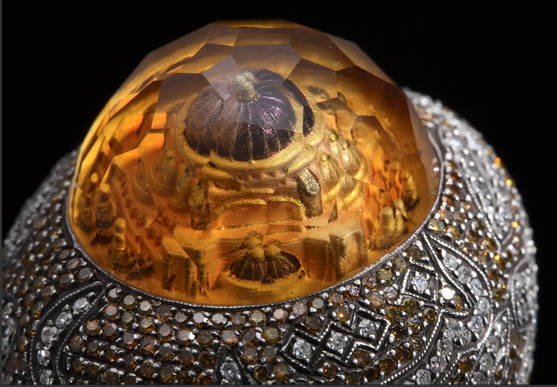 The most obvious of these designs is his "Hagia Sophia" ring, with the Roman church cut into the inside of a citrine. 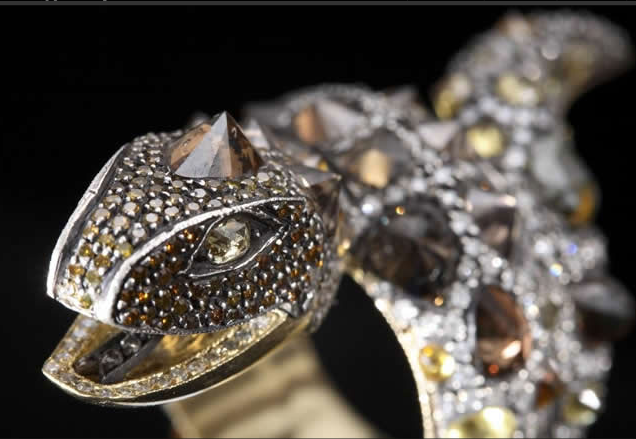 The citrine is then set in gold, pave set with brown and white diamonds which form an inscription in old Turkish (translation unknown). 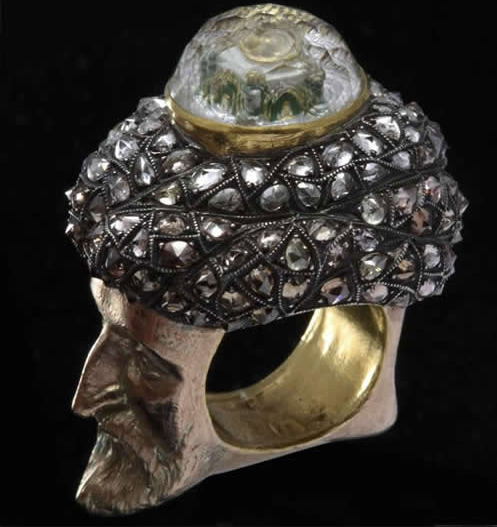 A second piece of a similar genre has a portrait of Mehmet the Conqueror in gold on the side of the shank and a small building of some sort cut into the white topaz of the main stone. 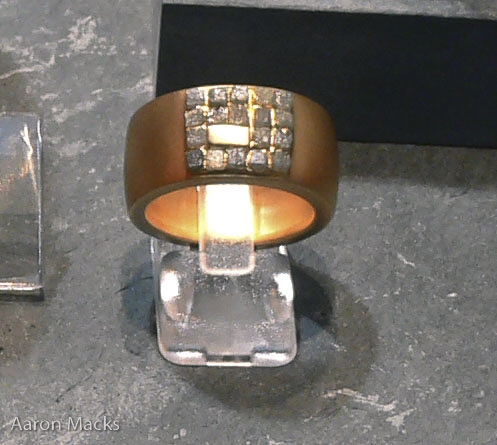 And one more from the same collection, less obviously "Turkish" than the rest, but I quite like the use of brown diamonds as color. 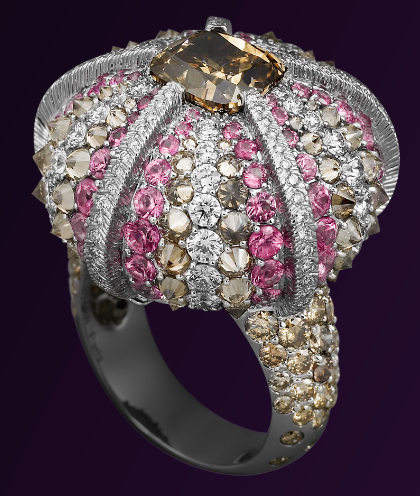 The setting of cut stones upside-down is reminiscent of Renaissance diamond rings. 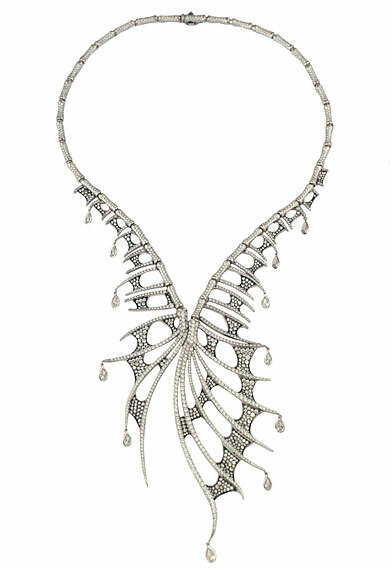 For his newest collection, Ida, Sevan has drawn from earlier periods of Turkish history with pieces drawing from the Greek era of Asia Minor. Mt. Ida is in the vicinity of ancient Troy, near the ancient city of Ephesus, cultic sanctuary of Artemis. 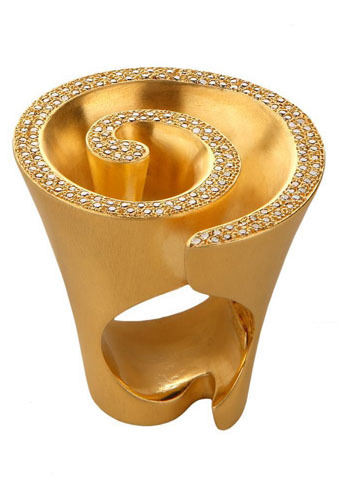 Couture Design Awards - An set of awards given out annually for excellence in jewelry design. Continue reading Couture Design Awards. 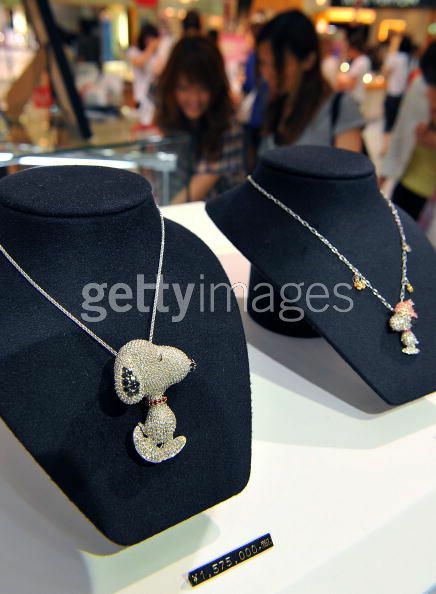 and yes, the stones (5+ct of diamond) are real, and the price is 1.5million Yen. 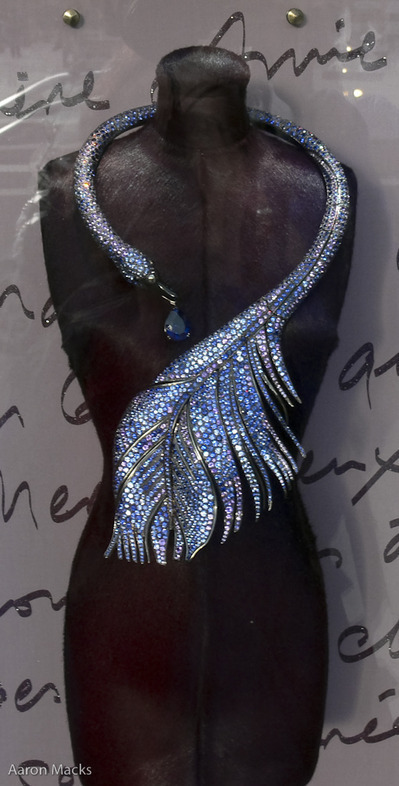 Much more exciting, finally a name to go with some pictures of uncut diamond jewelry I photographed in Paris, it is the work of Patrice Fabre. A fantastic watch blog, entirely in Hungarian. Even not able to read a single word, the movement section provided a fantastic collection of photos. 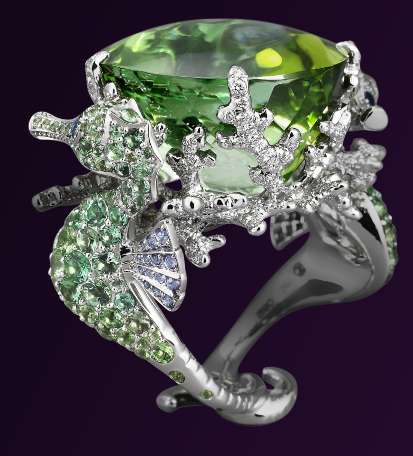 Continue reading More Links and Jewels. 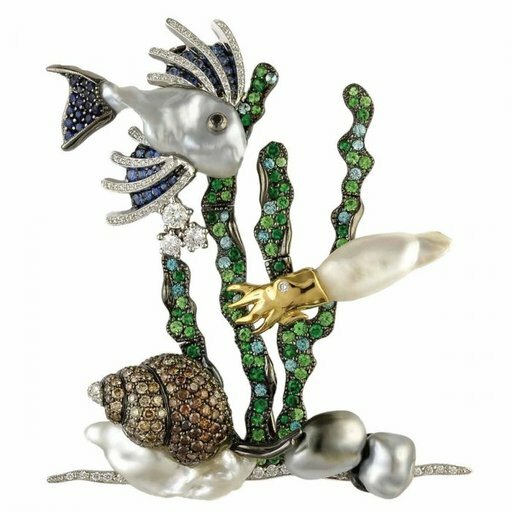 Autore doesn't have their Ocenia collection on their website, but Europa Star's new jewelry publication, International Jewelry has several more pictures, including a snail broach, a starfish pendent, soft coral earrings and this over-wrought harlequin shrimp. 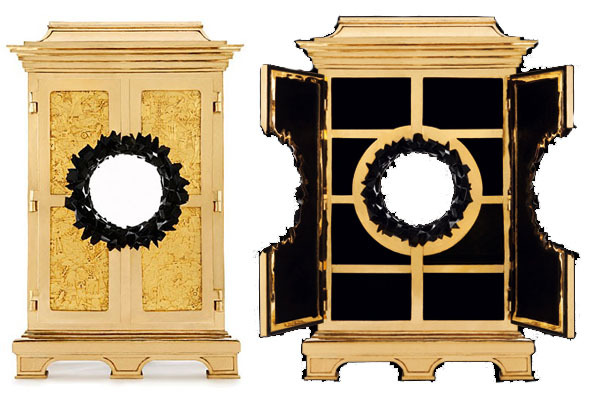 Finally some of the work of the Place Vendome-based Lorenz Bäumer. 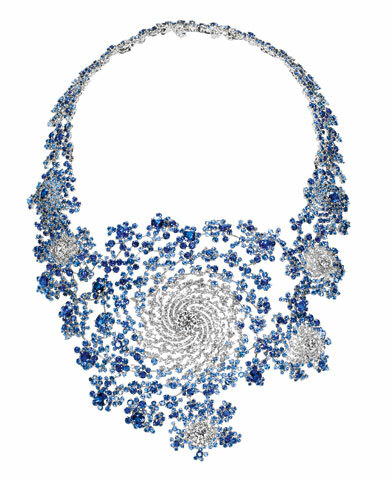 There was some debate a few months back about fractalness in design, but I think this necklace, designed by Marc Newson, by Boucheron can't be argued, it's a Julia set in gold, diamonds and sapphires. 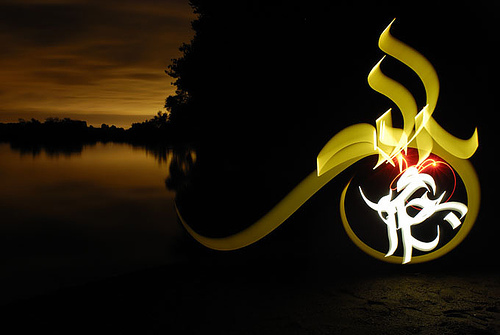 It springs from a more sedate design from the end of the 19th century. This is their 150th anniversary year, and as such they've been doing some interesting collaborations with other luxery brands, including a unique watch with jewel wheels by Richard Mille. Some of the pieces.